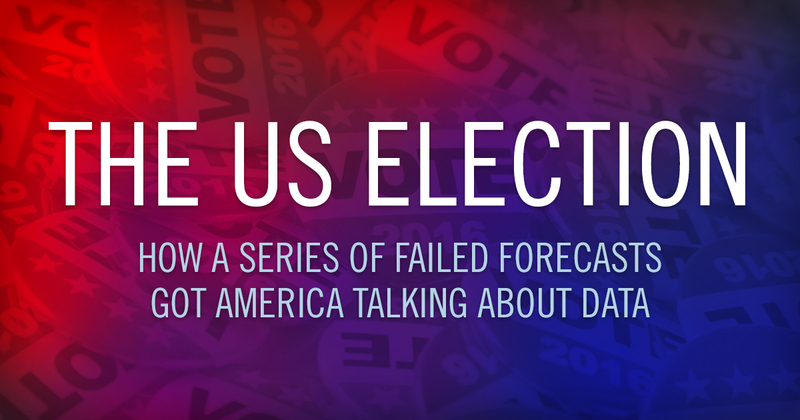 How a series of failed forecasts got America talking about data. Something to come out of this most recent American presidential election has been a lot of discussion around data, polling, and why people’s data informed predictions were so wrong. Why were the polls so wrong? How did people not see this outcome? Not surprisingly a lot of explanations have been offered up including the interesting concept of “moral licensing” as discussed in Malcolm Gladwell’s podcast Revisionist History. It will probably be some time before a complete picture is generated explaining the election. In the meantime one clear result of the election has been a very public discourse around data. The New York Times has written a piece about this and the wider implications that this election has been, for most people, a rare interaction with data. Most normal people don’t analyze sets of data in their everyday lives. Even though these same people are inadvertently generating trails of data (shopping habits, phone records, geo-locations, web history, etc.) the topic is really not something most people think/care about. How has the US Election created a new national discussion about the use of data? This election has been a very public example of how data can be used to make predictions & decisions. It has also shown how those decisions can still be wrong. Nate Silver, who perfectly forecasted the results of every state in the 2012 election, has been criticized for being so wrong this election. (As a side note Silver’s website FiveThirtyEight has several podcast episodes about the long history and current usage of polling data in politics.) He has subsequently defended the value of polling data saying that the data helps to give the probability of different outcomes but it does not definitively say what will happen. Hillary Clinton was never guaranteed to win, it was just more likely based on the data. It would be unfortunate if the general public’s next exposure to data analytics would be four years from now. One of the biggest obstacles in self-service business intelligence is having a data illiterate user conducting the analysis. You can give everyone access to an app but if most of the people don’t know how to analyze the information they are presented (or care to) then you won’t get very far. If there is a positive data-centric take-away from the election it's that perhaps more people may become more data literate.